Ready for some more ILNP awesome polish goodness?? Today I’ll be sharing swatches of their Holiday 2015 Collection! That’s right – A HOLIDAY COLLECTION! 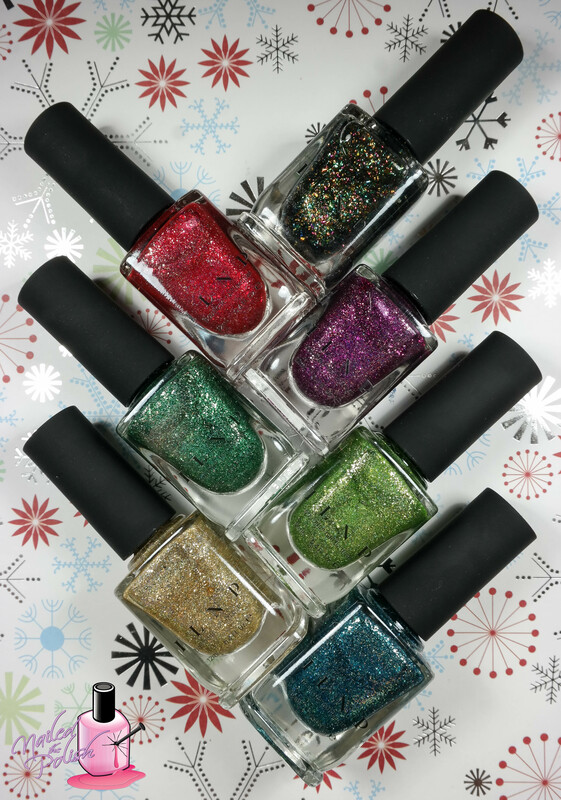 This seven piece collection consists of six bright holiday themed precious metals and one colorful flakie topper. ILNP Precious Metals polishes are polishes with a vivid metallic finish as they are filled with ultra-thin silver metallic flakes and added holographic. These polishes have NO glitter so removal is super easy! This collection along with their Winter 2015 collection is available for pre-order until 10pm PST tonight (11/24)! 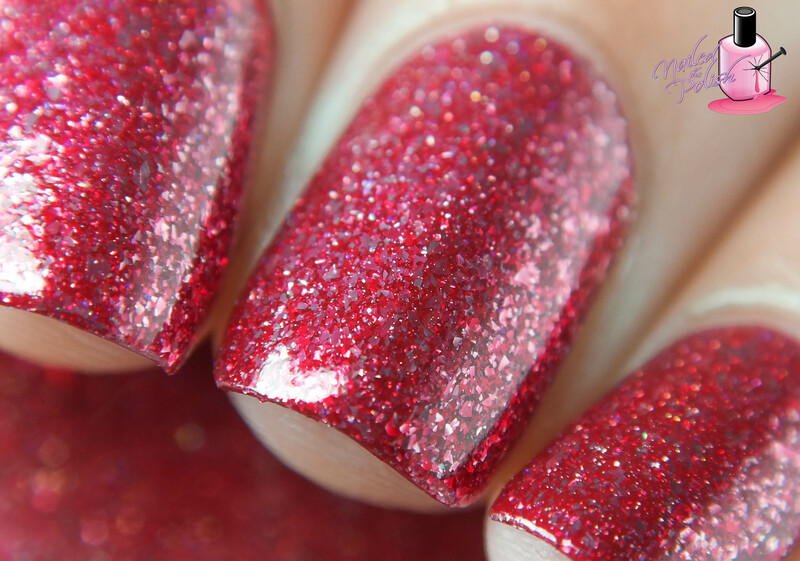 First up is Cherry Luxe – a vivid Christmas red Precious Metals polish. Shown here is two coats plus top coat. The formula is super easy to apply and control. Even though the Precious Metals polishes are filled with silver flakes, they apply just like the best cremes! The finish of this polish is amazing as is the bright red base. So, so perfect for the holidays! It’s a Christmas sea of metallic silver flakes! Lucky One is a vibrant pine green Precious Metals polish. Shown here is two coats plus top coat. Great formula with great drying and leveling! I have been looking for a green polish like this for ages! It’s the PERFECT Christmas green. Can you just imagine using this in combination with Cherry Luxe for a holiday mani?! Oh man, I’m starting to sweat just thinking about it..! I’m the Lucky One for having this polish in my presence! Just look at all those flakes! I’m dyingggggg! Time In A Bottle is a beautiful rich aquamarine-leaning (think in between turquoise and teal) Precious Metals polish. Shown here is two coats plus top coat. This polish right here is EVERYTHING. I was so amazed by it’s beauty that I pretty much just stopped functioning! It’s like I was instantly transported to a land filled with magical fairies, unicorns, rainbows, and nail polish! ❤ Forget Time In A Bottle, this polish is Perfection In A Bottle! I want to wear you forever! It’s a color-shifting Ultra Chrome rainbow!! Last up is Empire – a true gold Precious Metals polish. Shown here is two coats plus top coat. This polish is described as jaw-dropping, super ultra-shiny, awe inspiring, and the total package. I will be the first to attest that all of this is completely and 100% true! The true gold base intensely magnifies the already bright reflective nature of the silver flakes. I almost had to reach for my sunglasses because it was so blinding! This polish is truly extraordinary! I think my heart just skipped a beat… or two! I have died and gone to polish heaven! This collection is everything (and more!) that I could have ever wished and hoped for in a Holiday collection. Formulas are, of course, top notch. Each polish has such a bright and cheery ornamental feel perfect for the holidays and all year round for that matter. The nail art combinations with this collection are seriously endless! My personal favorites are Empire, XO, and Time In A Bottle – although, you can’t go wrong with any polishes from this collection! The ILNP Holiday 2015 Collection is available for pre-order here until tonight, November 24th, at 10pm PST. All polishes featured in this post are priced at $10.00 plus shipping but are $9.00 during the pre-order! Be sure to check out ILNP on Twitter, Facebook, and Instagram for more! Does this collection scream Holiday to you? Which ones are you dying to have?